Skipper Ricky Ponting has scored his 33rd Test Match hundred to rescue his side out of trouble on the third day’s play at the Adelaide Oval. The Kangaroos ended the day’s play losing just five wickets with 312 on the board leaving them 239 runs behind England. The situation is a lot better for the Australians after they were shaken up by Matthew Hoggard who took two wickets in his first spell of the morning. With just two more days to go, England bowlers have a tough task of taking another 15 wickets on this flat Adelaide Oval pitch. The homeside chasing 551 had resumed this morning at 28 for 1 losing Justin Langer before stumps on Day 2. Matthew Hoggard removed the other opener Matthew Hayden in just the fourth over today after the left hander drove his outswinger to the keeper. England pushed further with the wicket of Damien Martyn who played away from his body to be nicely taken at gully. Hoggard was getting the ball to swing in both directions; he compromised on his speeds and had the wicket keeper standing upto the stumps. But England’s hopes of pushing further into the Australian batting was kept to bay by Ponting and Michael Hussey who went onto put up 192 for the fourth wicket having batted together for more than 60 overs. 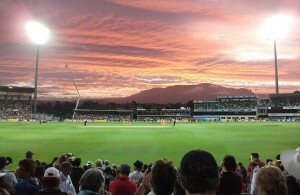 Ponting had made a terrific 142 under pressure before he edged a perfect outswinger from Hoggard to Geraint Jones. It was the second new ball that had done the trick for the tourists with Ponting edging the fifth delivery bowled with the brand new cherry. The Australian Skipper’s 142 had come in 245 balls with 12 fours. Hoggard gave further hope for England in pressing forward towards a possible victory later on by dismissing Michael Hussey for 91. The left hander had got a bottom edge onto his stumps after he had decided to shoulder his arms to a delivery that was bowled from over the stumps. Hussey was a bit slow but very effective in eating up the time in the Test Match as he faced 212 balls to score his 91 which came with 7 fours and a pull off Steve Harmison for a six! The Aussies did not lose any other wicket in the day’s play to end up at 312 for 5 with Michael Clarke on 30 and Adam Gilchrist on 13. Both sides have some work to do to accomplish their respective missions. The Australians would most probably look to kill as much time as possible as a victory isn’t that badly required for them at this stage. They are already 1-0 up in the series, so it’s all up to England if they can take quick wickets and add onto the lead they get. But looking at the way the pitch has played in the last three days, a result doesn’t look likely. It has been just Matthew Hoggard looking to take the wickets while the other have looked ordinary.